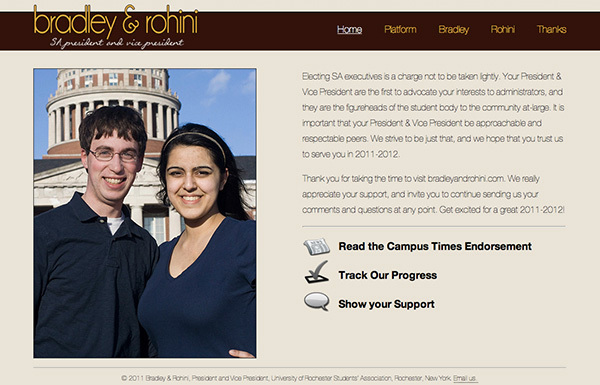 Bradley for President was Bradley’s successful 2011 bid for Students’ Association President at the University of Rochester. The campaign consisted of coherent online, banner, flyer, and postcard strategies aimed at pushing a personal and professional view to the student body. Unified marketing strategies make pushing an identity, and in turn a cause, far more comprehensive. Welcome! BradleyHalpern.com v.3 is currently in beta. What does that mean? It’s not quite done, but the new look and features were just too exciting to hold off on going live. In particular, expect to see a new logo, homepage tweaks, and lots of new content for the portfolio in the coming weeks, well, years (this site has never been a top priority). Word has it a Gallery may be on the way too. Browse around, and let me know what you think.